Ladybugs! 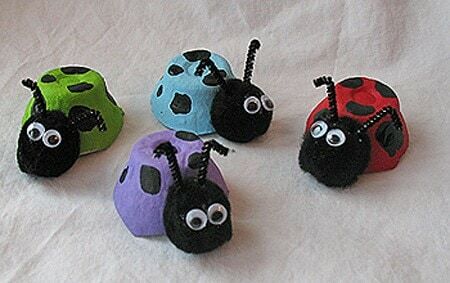 I love ladybug crafts because they are really easy for kids to make, teenagers think they are cute, and you can vary the colors to make just about anyone smile. 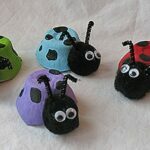 As you already know, using recycled items in my craft tutorials is a big thing with me, so it should be no surprise that these little sweeties are made from painted recycled egg cartons. I actually made these several years ago for the website I used to own, FamilyCorner.com. I wanted to share them here because they really are one of my favorites and I’m always happy to add to my arsenal of ladybug crafts. I’m afraid I don’t have any step by step photos since I did make this a while ago. But they are pretty simple, so I’m sure that the written instructions will be clear enough. Just let me know if you have any questions! Use scissors to separate egg carton cups, trim the edges. Paint egg cartons in desired colors and let dry. Glue wiggle eyes on to black pom pom and let dry. Glue black pom pom on to side of egg cup with white craft glue and let dry completely, making sure eyes are facing out and are where you want them. Cut the 2″ piece of skinny black chenille in half. Bend the end of each one to form the antannae. Use hot glue to attach antannaes to pom pom head. Use the handle end of a paintbrush to add black paint dots to the ladybug’s back. Dip handle into paint and pick up a generous amount, then use a drawing motion to add the dot to the ladybug’s back. Thanks Barbara glad you liked it! Hey, Amanda! I see you like ladybugs! Great idea with the egg cartons! If you find some tiny seashells that are smooth on top (we find them at lakes sometimes)you can paint them to look like a ladybug. I’ve done lots of them! You can coat them with polyurethane to prevent acrylic paint from chipping. My friends enjoy them as a cute little computer friend.